PRO-EUTHANASIA & ASSISTED SUICIDE? THINK TWICE! Euthanasia and Assisted suicide are ‘man’s choice’ of the moment to die. Man’s choice ‘short circuits’ his/her opportunities to prepare to meet our Creator. A ‘natural death’, in stark contrast, is death at God’s appointed time, the perfect and precise moment to die. Inherent in this natural death is ‘more time’ to consider and prepare for eternal life with God and our very own personal Day of Judgment immediately after death. Those people who advocate for euthanasia and assisted suicide are interfering with God’s appointed time. This premature death, hastened death is called murder. It is sin. It has eternal consequences. 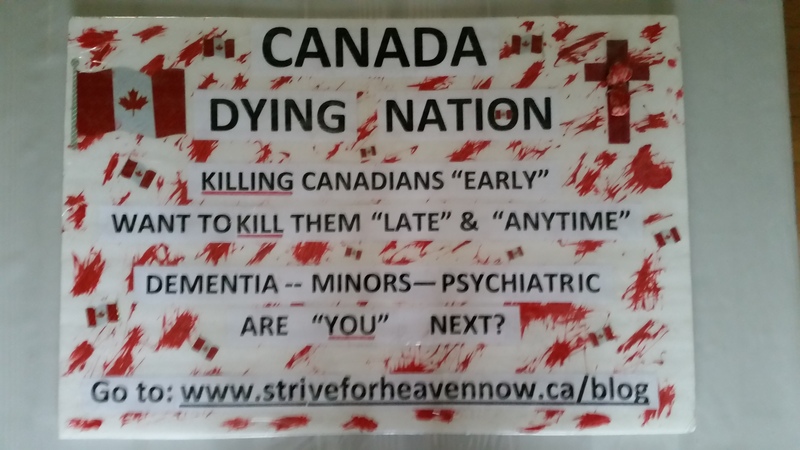 In Canada, there are many advocating through Bill C-14 for this premature death which is directly against God’s will for humanity. They are fighting and rebelling against God. This most sobering message, warning is directed to each and every person who is pro-euthanasia and pro-assisted suicide in Canada. The nine Supreme Court of Canada Judges, Justin Trudeau, Prime Minister of Canada, Federal Party leaders and every Member of Parliament and Medical Professionals who have supported or cast votes in favor of euthanasia and assisted suicide are putting the destiny of their soul in grave danger. They are playing “Russian Roulette” with Heaven and Hell. Each and every leader that I have just named is accountable to God for promoting the already existing demonic ‘Culture of Death’ which has all intents through Bill C-14 to kill even more Canadians ‘from the womb to the tomb’. Man does not have the right to terminate his own life, nor someone else’s life. To do so is to rebel against God’s ‘appointed time’ for our death, our departure from this temporal life into Life Eternal with God or the demons in Hell. Today, many of you aforementioned leaders are wielding enormous judicial or political power and control over the lives of other Canadians due to your appointed or elected positions which is being used for evil purposes. However, at ‘any moment’ it can terminate. Are “you” ready to meet your Creator, your ultimate Judge, Jesus Christ, the King of Kings and the Lord of Lords? “And it is appointed unto men once to die and after this the judgment.” Hebrews 9:27. One lady, who was “pro-choice”…choice to kill, a Dr. Gloria Polo, suddenly died when she was struck by lightning. However she miraculously returned to life. She knows what I mean when I speak about “suddenly appearing before the Judgment Seat of Christ”. You can read her sobering testimony here at ( http://javaemerald.com/religion/gloria_polo_testimony.html ) or read her book, “Struck by Lightning:Death, Judgement and Conversion.” ( http://www.amazon.com/Struck-Lightning-Death-Judgement-Conversion/dp/298108965X ) I sent Justin Trudeau a copy of her book along with my “Open Letter” to him several months ago. I hope and pray he has read it. Someone please ask him. Like Saint John the Baptist, I call all Canadians to repent and turn to Jesus Christ, the Savior of humanity before it is too late. God’s chastisement is emminent for Canada if most Canadians continue with their sinful lifestyle. 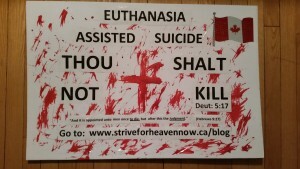 Canadians need to repent, earnestly seek God’s face and PRAY ( http://striveforheavennow.ca/a-national-rosaryprayer-campaign-against-euthanasia-and-assisted-suicide-in-canada/ ) to put an end to this Culture of Death that Canada is drowning in. What Canadians need is ‘life-giving’ Palliative Care, with intent to relieve suffering and prolong life while giving love and hope, not to kill that sick person through euthanasia and assisted suicide. If Bill C-14 passes, instead of being healers our doctors will become legalized serial killers just like the abortionists. Before June 6 of 2016 Canadian Parliament under the Liberals is intent on making euthanasia and assisted suicide legal. To each and every politician and Senator I urge you to VOTE AGAINST this Bill C-14. You ultimately will have to answer to God, not Justin Trudeau! 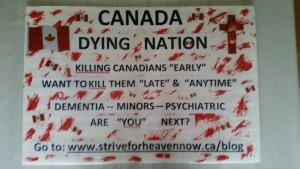 Don’t go down in history as having voted to permit Canadians to kill themselves and to kill others. Your vote will be weighed in the balance on your personal Judgement Day. Each and every human life is so precious, whether young or old, brilliant or not so brilliant, physically healthy or crippled or handicapped. Each and every “additional moment” of life on this planet earth is so precious! Why? Because God in His great love and mercy is granting us ‘ another chance, another moment’ to repent of our sins and turn to Jesus Christ, His Son as our Savior and Lord. He is a loving and merciful God for those who wisely chose to turn to Him. In 2005 I wrote a very special poem titled “Time is Precious.” which is so pertinent at this pivotal moment of Canadian history. 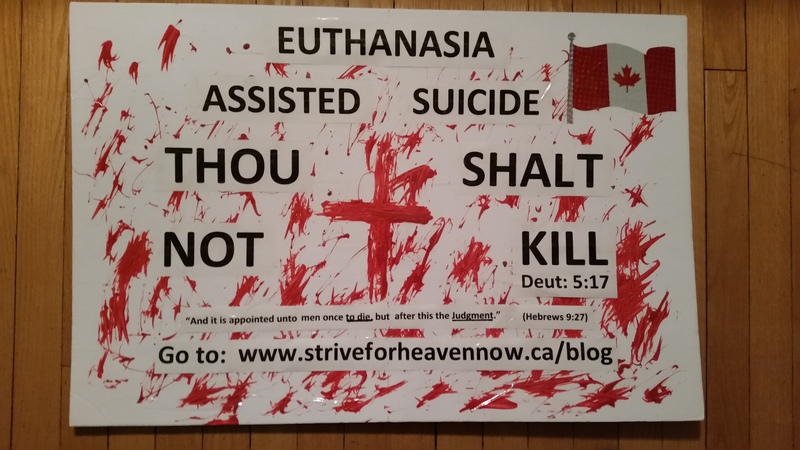 Please read it and you will understand why each additional, God-given moment of life is so precious and why euthanasia and assisted suicide must not be allowed in Canada and in the world. In other words St John is saying that when we die and experience our Personal Judgment, it is Love that will judge us. Yes, will we have wholeheartedly loved God and our neighbor or lived a selfish self-centered life, a life of indifference towards our neighbors. To love our neighbour in deed and in truth is to vote for and enact laws which will ensure that every human being’s life is protected and loved by one another from the moment of conception till their natural death. Euthanasia and Assisted Suicide are not love and compassion, nor care, they are the termination of a precious human life before it’s God appointed time. As a Member of Parliament you will soon cast your vote on Bill C-14. Your vote will be crucial in determining whether Canada will sink even deeper into its ‘Culture of Death’ or make a turnabout and promote a ‘Culture of Life’ pleasing to God. 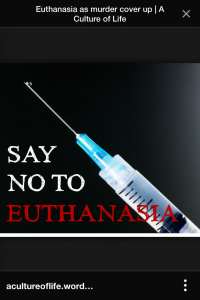 Remember that if you vote for or support Euthanasia and Assisted Suicide you are complicit in the future murdering of millions of Canadians AND you are playing ‘Russian Roulette’ with the eternity of your very own soul in Heaven or Hell FOREVER! May ‘you’ be one of those MPs whose legacy before man and God will be to have voted for ‘life’ and not for ‘death’ of millions of Canadians. Donald Andre Bruneau, B.Th, M.P.Th.